January 4, 2018  All Songs Considered hosts Bob Boilen and Robin Hilton return after the holiday break with a new mix of essential gritty guitar rock, an epic breakup song, sweetly seductive pop and more. January 4, 2018  The band's fourth album, its most ominous and sonically dramatic, is also a work of brilliant storytelling about a man losing his memory. October 25, 2016  This week's show features new music from Run The Jewels, The Flaming Lips, a funny tune from John Prine, and more. November 3, 2015  This new video by Kyle Morton of Typhoon is the product of an unusual collaboration. Ten short musical vignettes, each just a minute long, written to be paired with a snippet of video. 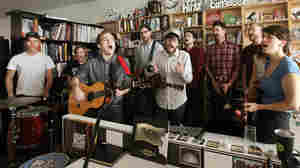 October 26, 2013  The dozen members of this Portland, Ore. band crammed behind the Tiny Desk for a transcendent set. 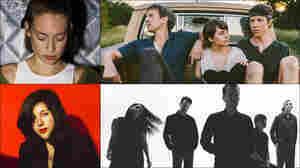 See them perform songs from their latest album, White Lighter — the best arranged and most compelling of Typhoon's nearly 10-year run. August 31, 2013  Kyle Morton, leader of the Portland, Ore. musical collective Typhoon, can trace the start of his songwriting career back to one life-altering bug bite. 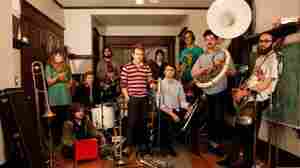 October 11, 2011  With 13 musicians and a plethora of instruments, this joyous group can create a massive sound. 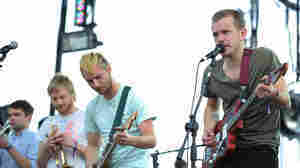 But Typhoon's playing reflects restraint and patience, as well. 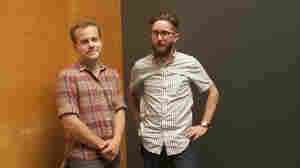 September 19, 2011  The Salem, Ore., band fuses symphonic grandeur with the homespun intimacy of indie rock. 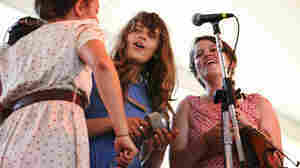 July 30, 2011  Hear the 17-member indie-folk band bring its soul-stirring beauty to the Harbor Stage at Newport. 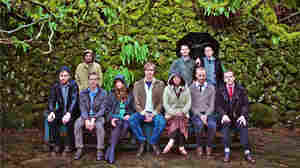 May 29, 2011  With an arsenal of strings and brass, the large Portland collective produces a joyous, uplifting sound. May 28, 2011  The Gorge amphitheater outside Seattle has to be one of Earth's most beautiful spots, and it's the backdrop to a long weekend of amazing music.